If you are an avid reader, you may be in need of a bookmark. A good way to always have a bookmark on hand is to make your own. These bookmarks are easy to put together and you can personalize them with your favorite colors and styles of paper and fun embellishments. I generally am in the middle of 2 or 3 books, so having multiple bookmarks is a good thing. 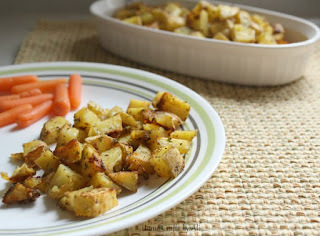 These are so easy and quick to make that I crafted quite a few of these. They are great as a gift for your bookish friends too. If you have a book club, when it's your turn to host you can make bookmarks and add fun quotes from the book that you read for the month. This post contains affiliate links. I will receive a small portion of any sale in exchange for advertising these supplies. 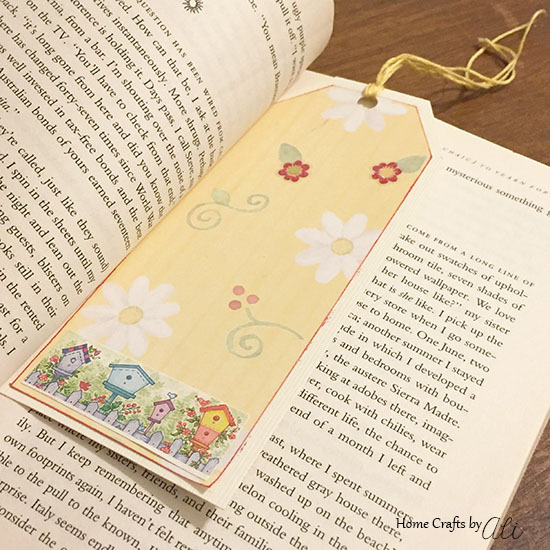 You can make these bookmarks with just a few craft supplies. In about 10 minutes you will have paper bookmarks just how you want them. Gather your supplies and get crafting! 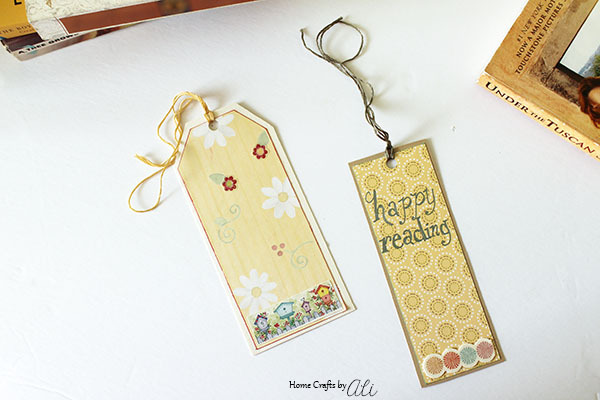 I use cardstock as a base for these bookmarks because it is thick and sturdy. A small part of the cardstock will show around the border, so make sure it is a color that you like. My favorite part of this project is looking through my papers and stickers to see what will work for each bookmark. Thankfully I have quite a stock of both on hand to choose from. 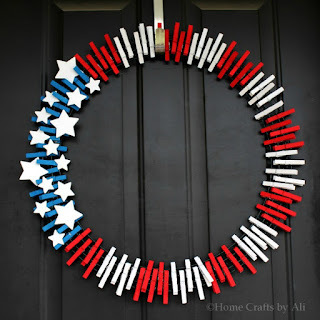 This was a great project to use up some of my crafting supplies since I am moving my craft room. Less to lug up the stairs! 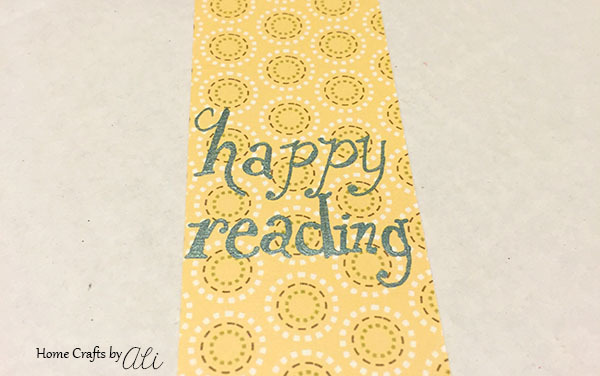 Trim your cardstock to the shape that you want your bookmark to be. I start out by making a rectangle of the cardstock. Sometimes I leave the bookmark as a rectangle, other times I shape the top by trimming a bit. After you have your cardstock ready, cut the scrapbook paper to be just a bit smaller than the cardstock base. 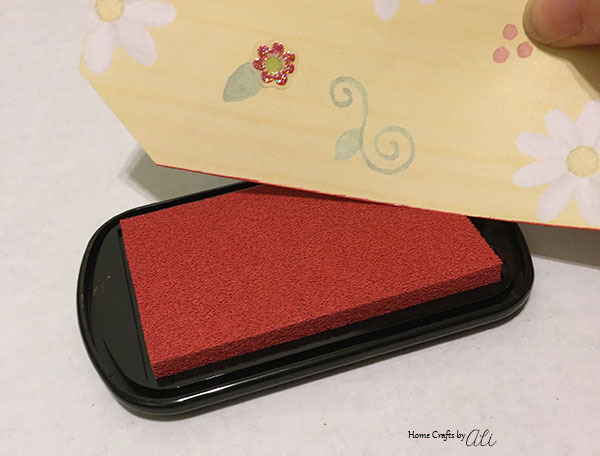 Use an ink pad to add a little definition to your scrapbook paper. Lightly run the edge of the paper on the ink pad. This will make your scrapbook paper stand out a bit from the background. Add any stickers you want to the scrapbook paper at this time. I added a few flowers and a set of birdhouses. 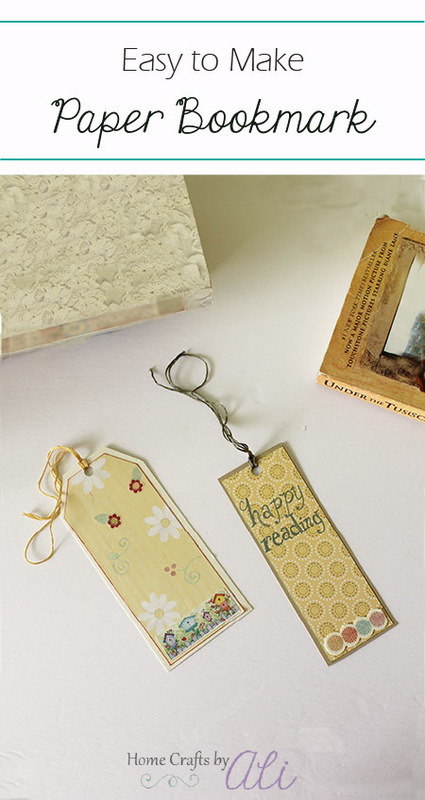 You could also use washi tape, ribbon, or die cuts to embellish your bookmarks. Write a book or reading quote with glitter gel pens if you like. 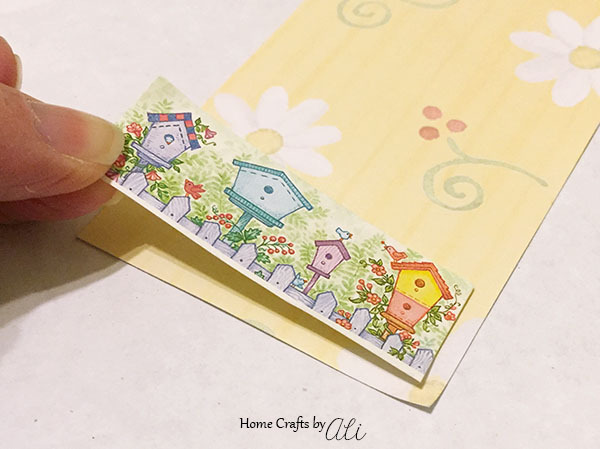 Use glue dots to stick the scrapbook paper onto the cardstock. Use a hole punch toward the top of your bookmark. Cut about 12 inches of your embroidery floss to make a tassel for your bookmark. 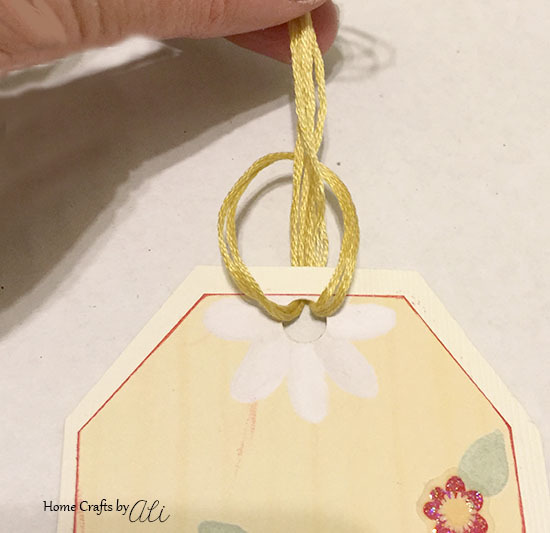 Fold your floss in half, then put the looped end through the hole in your bookmark (loop in front, hanging thread in the back). Make the loop large enough that you can bring the thread from the back through the loop and gently tighten. Then you are done! You now have a cute personalized bookmark. These are great to use for yourself, or as a small gift for someone who loves to read. They are quick to make and an easy craft for an afternoon. Every month a group of bloggers are challenged by C'mon Get Crafty to create a new craft or project from their own stash of goodies! 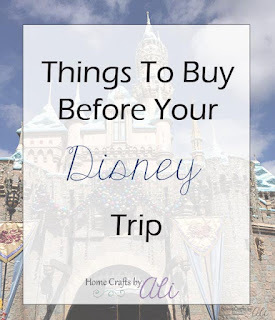 Everyone is allowed a $10 allowance for necessities to complete their project (i.e. paint brushes, glue, etc), but the bulk of it must be created from their own stash of goodies. 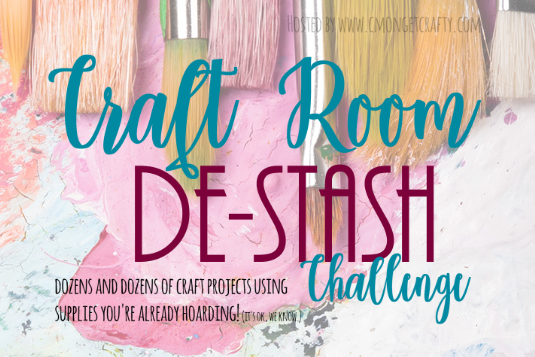 I was able to use all of my own craft supplies for this destash challenge. Welcome to the craft destash! Your bookmarks are so pretty! Thanks for the detailed instructions for making them! Thanks Roseann! It's fun being able to use up a bit of my stash. Haha! That's what our bookmarks used to be. Now my kids help make their own so they take care of them a bit better. Thanks for pinning Marci! 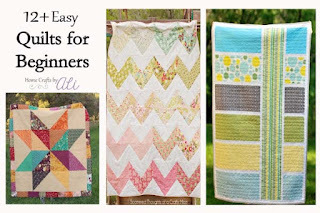 They are so easy to make and you can add whatever embellishments you happen to have. I've made a few bookmarks for myself and my boys, as I love to encourage reading. I love how you created yours, and such a fabulous idea for de-stashing! What pretty bookmarks. I love this idea and I've got all of the things I'd need on hand to make some. I like the tip about how you used the ink pad. Nice that you already have the supplies! Those are the best crafts! Such pretty bookmarks! I've meaning to make a cute bookmark for my daughter. She loves reading. The paper you used is really pretty. I'm go in ng to have to search through my scrapbook paper stash and see what I find. I always have scraps of paper and making bookmarks are a great way to turn them into something useful. Thanks Alexandra! Great idea as a gift too!